You can use it to prepare a lovely jellied entrée made with crab or chicken, desserts made with fruit or, as a special holiday treat, with cat food, in homage to television’s Griswold clan’s Aunt Bethany. The star and Christmas tree molds suggest raspberry jello. Today’s food mold might only be seen in the most inspired of retro chic kitchens. However, in the 1960s, when Tupperware manufactured this model, good hostesses knew how to impress guests with their sweet or savory impressively shaped concoctions. The hostess would have acquired this mold at a Tupperware Party, a marketing tool devised by Brownie Wise in the early 1950s. Wise had found that, as a sales representative, she was most successful in selling Tupperware products when she invited her friends and neighbors to a home gathering, where she could also display her own skills as a hostess, while using Tupperware products. Soon, Wise recruited other women to host the parties, rewarding them with free products. Earl Tupper, who had founded the company in 1948, was so impressed that he made Wise Vice-President of Marketing in 1951, and the Tupperware Party became an internationally recognized phenomenon. Tupperware had an enormous impact on the women of the 1950s and 1960s, who were largely in charge of managing the household. 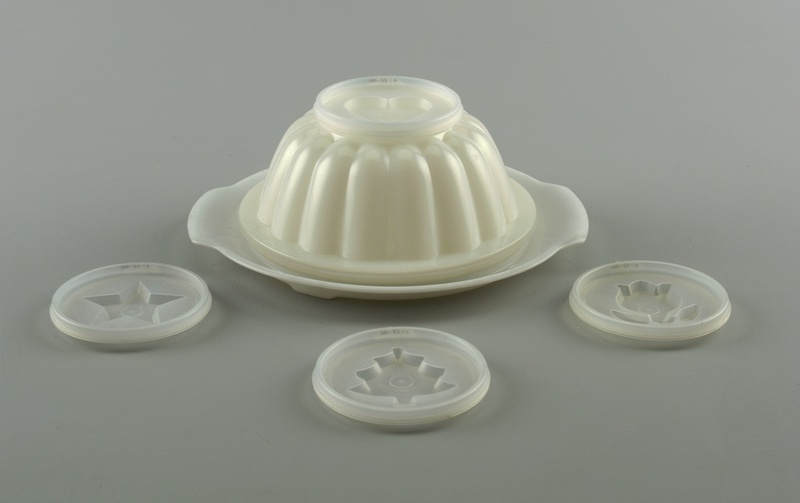 The clever plastic containers allowed food to be stored safely for longer periods of time. They also allowed food to be packaged and taken out of the home, making it easier to provide spouses and children with neatly-contained meals to eat on the go. In addition, the Tupperware Party had a profound influence on women’s financial independence, by making it more acceptable for them to work outside of the home, and establish themselves as small business entrepreneurs. Delightful post. I could be wrong, but I believe Aunt Bethany was a character in one movie (“National Lampoon’s Christmas Vacation”), not a television series. Jel-N-Serve Food Mold, ca. 1960; Manufactured by Tupperware Corporation (American, founded 1946); Molded plastic; Gift of Bonnie Bledsoe-Fuchs, 1991-33-1-a/g.